This image shows a smoothed reconstruction of the total (mostly dark) matter distribution in the COSMOS field, created from data taken by the NASA/ESA Hubble Space Telescope and ground-based telescopes. It was inferred from the weak gravitational lensing distortions that are imprinted onto the shapes of background galaxies. An exhaustive study of nearly half a million deformed galaxiesobserved by the Hubble Space Telescope has revealed definitive proof of theacceleration of our universe?s expansion. A team of astronomers took a close look at more than446,000 galaxies observed by Hubble in 557 overlapping photographs — making itthe largest survey ever performed by the iconic space telescope. Theobservations, taken from Hubble?s COSMOS study, are the latest confirmation ofwhat scientists have long thought, that a mysterious force called dark energyis driving the universe to not just expand, but to expand at an ever-fasterpace. "The sheer numberof galaxies included in this type ofanalysis is unprecedented, but more important is the wealth of information wecould obtain about the invisible structures in the universe from thisexceptional dataset," study co-author Patrick Simon fromEdinburgh University said in a statement. Astronomers have long known that the universe isexpanding based on observations dating back to 1929, when famed astronomerEdwin Hubble — namesake of the Hubble Space Telescope — measured the cosmicspeeds of many galaxies. ?He discovered that those galaxies were all movingaway as they sped across the universe. In 1998, two teams of astronomers announced that not onlywas the universe expanding, but it was accelerating as well. In fact, thefarther away a galaxy is from Earth, the faster it is moving away, researchershave said. Ultimately, theory holds, galaxies will recede so farfrom each other that light from one galaxy won't reach the others, andintergalactic observations and communications will become impossible. Onlylocal groups of galaxies are expected to hang together, and even that'suncertain over the long term. One wild idea has the runaway expansion leadingto a BigRip,when perhaps 30 billion years from now even the stars of an individual galaxyfly apart and finally planets are ripped asunder. Then, even atoms won't be able to holdtogether. The universe?s acceleration also confirms AlbertEinstein?s theory of general relativity, since the expansion was required bythe famed scientist?s cosmological constant in that famed equation. In the new study, astronomers used the so-called "weak gravitationallensing" effect of distorted distant galaxies to measure thedistribution of matter across the universe on a cosmic scale. ?They alsomeasured the distances to 194,000 of the galaxies observed by Hubble usingground-based telescopes. The research will be detailed in an upcoming issue of theAstronomy and Astrophysics. The new observations give astronomers a clue into howmatter in the universe clumps together due to gravity, and then is driven apartby dark energy. "Dark energy affectsour measurements for two reasons. First, when it is present, galaxy clustersgrow more slowly, and secondly, it changes the way the universe expands,leading to more distant — and more efficiently lensed — galaxies," saidstudy co-author Benjamin Joachimi from the University of Bonn. "Our analysis issensitive to both effects." There?s an added bonus tothe study, too. 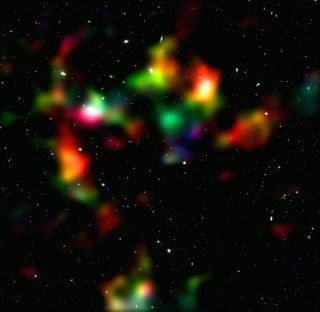 It also helps build a clearer map of the universe and howgalaxies are strewn about it, researcher said [more galaxyphotos]. "Before, most of thestudies were done in 2D, like taking a chest X-ray. Our study is more like a 3Dreconstruction of the skeleton from a CT scan," explained study co-authorWilliam High of Harvard University. "On top of that, we are able to watch theskeleton of dark matter mature from the Universe's youth to the present." DoesThe Universe Have an Edge?